I can't get into the steam game thing that they have that gives you card drops for the Steam summer badge, so I was wondering if anyone has the names of the cards so I can just buy/trade for them. You can see the all cards when you log into your account, hover over your name in the menu and then choose "Badges". There you can look at all Monster Summer Sale cards by clicking on the box of Monster Summer Sale. 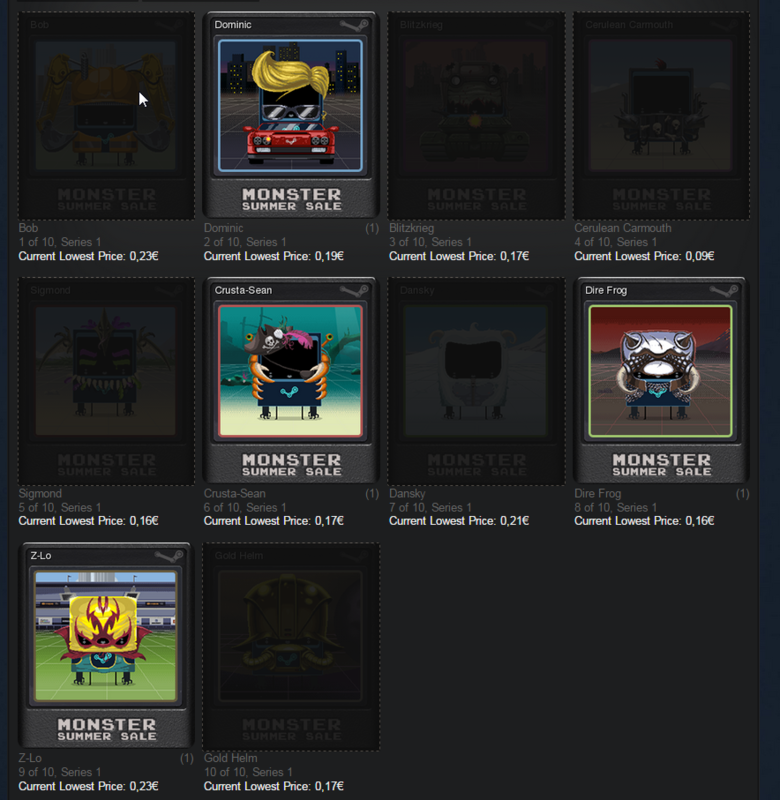 How many levels are there for Steam Trading Card badges? Can you craft badges or use card boosters for games you don't own? Can I get Steam Trading Cards from game demos? How many times do I need to collect sets of Steam Trading cards? How can I collect all the Snow Globe Trading Cards with many restrictions on my account? Will I get the cards for Steam Christmas sale ever? How do I get card drops in the Steam summer sale game? How to earn Monster Summer Sale cards? Can you still earn cards from the Monster Summer Sale? If I earn trading cards on steam when level 10 do I have to craft badges for xp or just get the cards?